The Equestria Games are approaching and a delegation needs to be chosen from Ponyville. 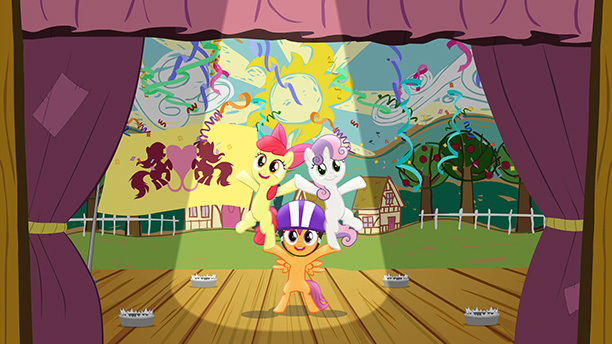 A pony or team of ponies will carry the flag for the delegation of athletes from Ponyville. All they have to do is be picked for the best presentation. 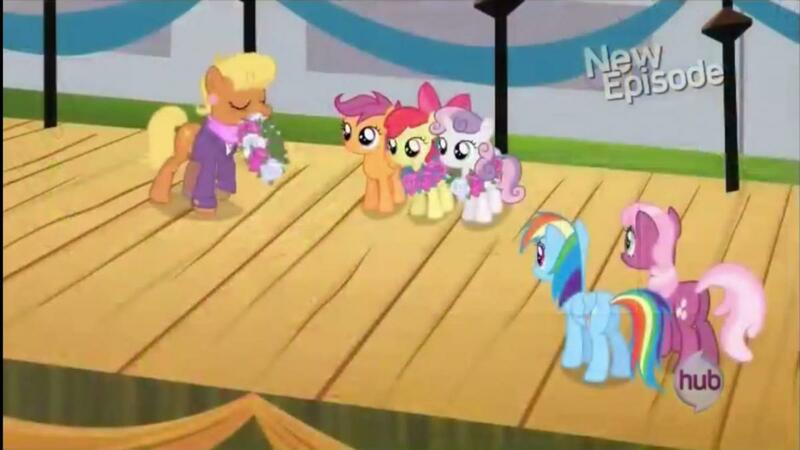 Rainbow Dash is in charge of training the young fillies during the whole escipade. Flight to the Finish is all about bullying, growing up and growing past your insecurities. Let me tell you something though, you never really escape these things. 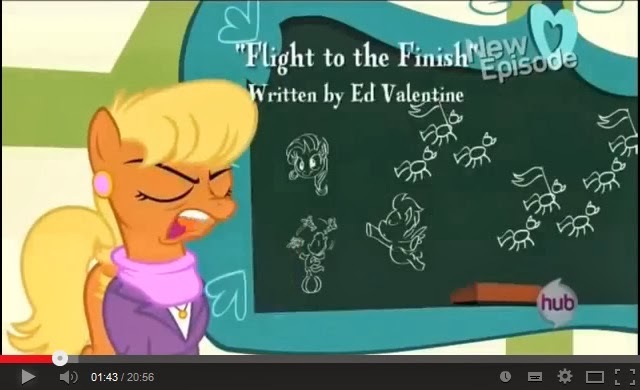 At least these topics are progressing past the Babs Seed episode or the first episode with the Cutie Mark Crusaders. Watching the Crusaders like creepy stalkers, DT and SS learn that Scoot-a-Loo is very self conscious about growing up. They find her missing scale and toss a black arrow at it. They made fun of the fact Scoot-A-Loo can’t fly yet. She’s not growing up as fast as the other pegasus ponies and Scoot-a-Loo feels weird about it. She starts to over think things and gets completely trapped in her own head. Sweetie Belle and Apple Bloom are good friends and first they try and talk her through things. Then they try to work through things her way but it doesn’t work. When they try and reason with her, it doesn’t work either. Eventually they do get frustrated, almost letting SS and DT destroy their trio. Luckily an adult, and Scoot-a-Loo’s hero, Rainbow Dash has a talk with her about things. 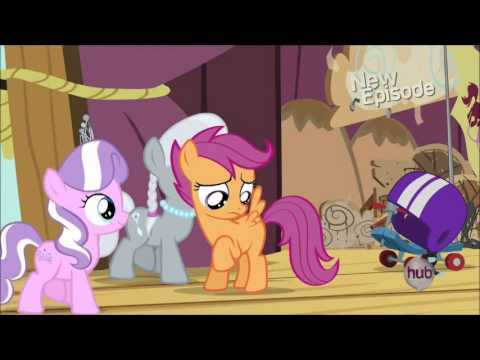 The episode was pretty sophticated because Apple Bloom and Sweetie Belle both realize what’s going on and try to undo the damage to their friend. They also don’t give up even when one of their team does throw in the towl. 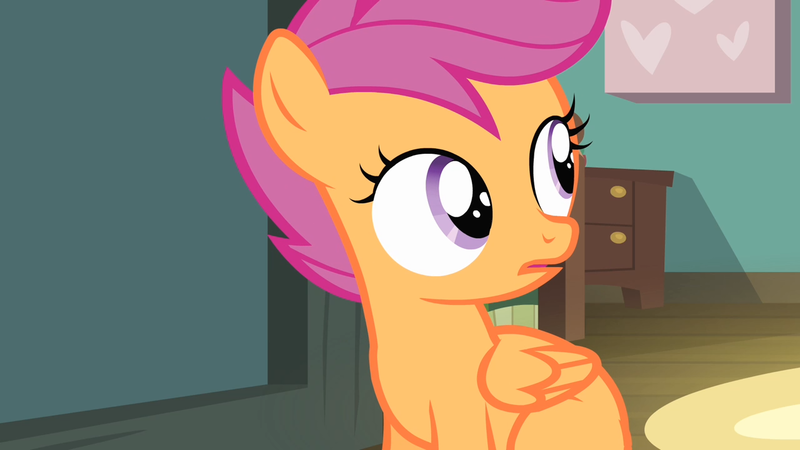 Luckily, Rainbow Dash knocks some sense into Scoot-a-Loo and she decides to perserver. They realize that no matter what, they will always be friends. They also discover that everyone grows up at their own pace. I think everyone remembers that time… when you were a little more akward? For girls you never know when you are going to bloom into a woman or get your period. For guys it’s that whole hair every where and voice dropping time. Sometimes you just progress at your own pace, may that be faster or slower than you friends. They still love you if they are real friends. I am enjoying the developement in the characters. The girls are way less bratty, adults are calling them on their antics and the trouble makers are feeling the consequences of their actions. SCOOT-A-LOO ISN’T HOMELESS! See… even she isn’t surprised. Where are the parents though? !